It’s often said that one’s ability to delay gratification is an important factor of success in personal finance. When you don’t buy that new whatever until you have enough money to pay for it, you save on interest you would otherwise pay. When you save a portion of your current pay for retirement, you are foregoing higher consumption at the present for better living years into the future. Series EE Savings Bonds ("EE Bonds") are one such test for delayed gratification. EE Bonds are a type of savings bonds issued by the US Treasury to small savers and investors (the other type is I Bonds). In addition to buying $10,000 per year per Social Security Number in I Bonds, you can buy another $10,000 per year per Social Security Number in EE Bonds. EE Bonds pay a fixed interest rate, currently at 0.6% a year. That’s low, considering that you can get 0.9% to 1.05% in a "high yield" savings account from say American Express or CIT Bank. But EE Bonds offer a bonus at the end of 20 years. The value is guaranteed to double if you hold that long. 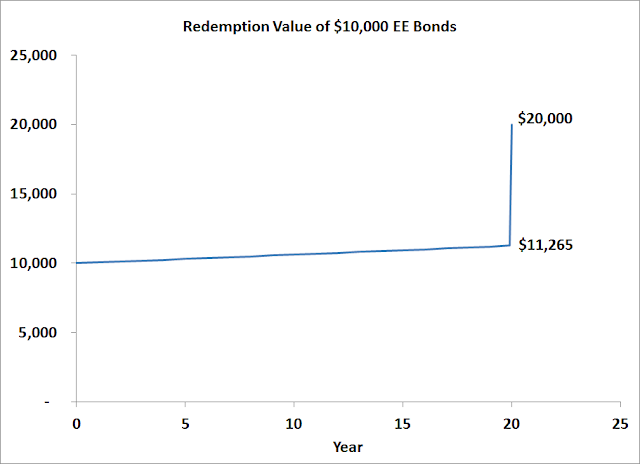 This means that if you buy $10,000 EE Bonds, after 19 years 11 months the redemption value is only $11,265. One month later, it jumps to $20,000. If you hold on for 20 years, the average annual return comes out to 3.5%. This compares favorably to the yield on regular 20-year Treasury bonds at 2.4-2.5%. Once again, this is one of the cases where individual investors have an advantage over institutional investors, but only if you are able to delay gratification for the full 20 years. The chart below shows the value of a 2.5% 20-year Treasury assuming all interest payments are reinvested at the same rate. 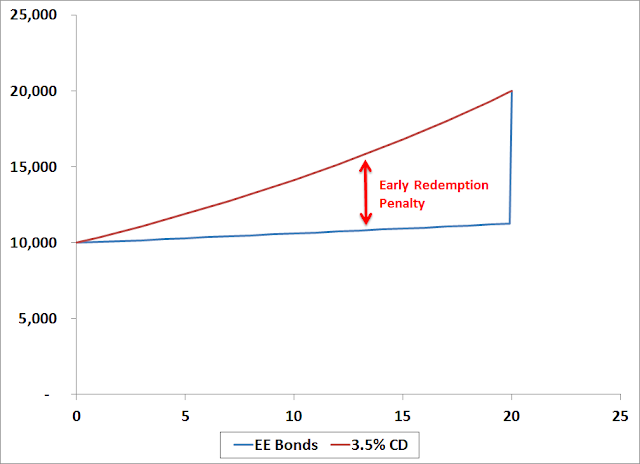 Compared to an instrument that pays 3.5% a year evenly, you can say EE Bonds effectively have an increasing early redemption penalty. The most severe case would be at 19 years 11 months and 29 days. If you can’t wait just one more day, you would pay a penalty of more than $8,000 to redeem bonds worth $20,000. That’s insane. 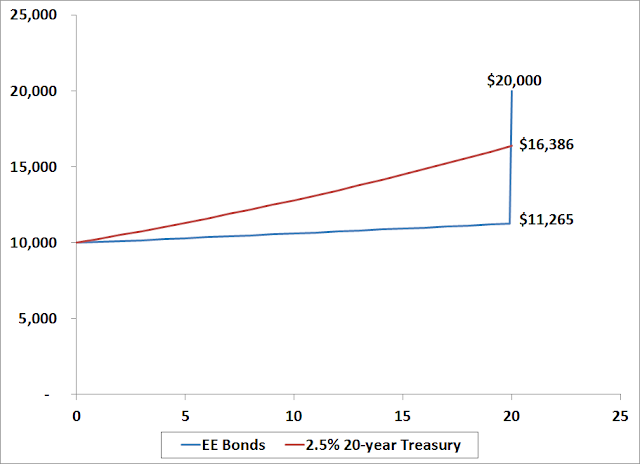 If you buy EE Bonds, you must plan on holding them for 20 years. Once you hold them for a few years, the effective early redemption penalty will be quite large. 20 years is a long time. What if you buy a CD now and see what happens after a few years? It could work if rates rise. Suppose you buy a 5-year CD from CIT Bank that pays 1.8% today, then another one at 2.8% after it matures five years from now, then at 4.8% for the next two rounds, you will get to about the same place as buying EE Bonds. This scenario is not implausible but who knows what CD rates will be 5, 10, or 15 years in the future. Buying CDs of course gives you flexibility. At each renewal you get a chance to see if there’s a better use of your money elsewhere. It’s a reasonable alternative if interest rates will go up. If interest rates stay low though, you would be better off in EE Bonds. Current laws allow tax-free treatment of interest on EE Bonds used for higher education expenses. A holding period of 20 years matches well with the need for college expenses for a baby. There is an income limit for the tax exclusion. The modified AGI phaseout range started at $71,100 for single and $106,650 for married filing jointly as of 2011. The income limit will go up with inflation. If you anticipate that your income in 20 years will be under the limit and the laws won’t change by then, EE Bonds can be used to supplement a 529 plan. Buy EE Bonds Or Not? Can I resist the temptation of getting paid more now, say in a 5-year CD, versus waiting for the final bonus from EE Bonds in 20 years? I must admit it’s very hard. Will I realistically be able to hold this thing for 20 years? I have to be honest with myself: I don’t have an iron will. The chances of my abandoning it in the next 20 years are very high. The delay is too long for a reward too small. I don’t want to torture myself over this in the next 20 years. At the end of the day it’s only $10,000. I have better plans for $10,000. Stay tuned as I explore in the coming weeks in my "double the bond yield" series. What if it was an amount you would not miss, like $100 instead of $10,000? If you’re willing to open a checking account you do not need for a $100 Amazon gift card, why not buy a $100 EE Bond for its $100 bonus 20 years from now? J – If the amount is small enough you don’t care about what return you earn, sure. Then by definition it won’t do much either way. The $100 Amazon gift card can lower my expense right now. The account also pays me additional reward points for more Amazon gift cards on an ongoing basis. The 20 years is the problem. If EE bonds pay 2% each year and then give an additional bonus at the end to make it 3.5%, I would buy them in a heartbeat. The 20 years is the problem. If you are going to lock up the money (mentally) for 20 years, then it could be invested in something more long term (e.g. stocks). I guess EE bonds would be OK if you have a large emergency fund, big enough that you probably won’t touch a part of it for those 20 years. And the bond funds in the title? Do you consider them akin to rolling CDs? Alanb – Yes, akin to rollling CDs and probably worse than rolling CDs at current rates. When CDs mature, if the market rate is higher, you can immediately jump on to a higher rate without suffering a loss. In a bond fund, you always have to take a loss first before the higher interest rates compensate you for the loss. Great article. Regarding the decision whether to buy laddered CDs or EE bonds. EE bonds have 2 advantages: the interest is tax-deferred for up to 30 years, and the interest is city and state tax free. I suspect that the government is doing all it can to kill the Savings Bond program. Savings Bonds are a great deal for the small investor (as you showed), but they are an expensive way for the government to fund its debt. Those interested in buying EE bonds may want to act sooner rather than later. In the past, the Treasury has given short notice when they changed the Savings Bond program. My bond education continues, thanks for the article, this was timely as I was just about to start looking into EE bonds after researching I bonds. I also like the link to the stanford marshmallow experiment haha! I’m not sure the 3.5% return is high enough to justify a 20 year holding period. I think you would be able to get a better rate for this duration with a secondary market annuity. Not as safe as an EE bond though(due to the legal risk), but they pay more. Does this apply to old EE bonds. I have 30 $1000 bonds purchased 2/93 for $30,000. They are now worth about $40,000 according to savings bond calculator. Will these be worth double the amount the government site calculates their worth at 20 years minus one day? They have already gone up substantially. Diane – No this does not apply to EE bonds issued in 1993. You paid only $500 for each $1,000 bond in 1993. It’s worth $1,368 now. The value already more than doubled. Hang on to them until 2023 because they are earning 4% interest now. Thanks for the reply. I figured it was too good to be true. When I bought those bonds I thought it was a waste of money. None it is the best interest I can get. The fixed rate on EE bonds now dropped from 0.6% to 0.2%. It doesn’t affect the 3.5%/year return from holding 20 years though.